It's been a year since a VIA Rail train went off its tracks in Burlington, Ont. — leaving three dead — but surviving passengers say they still struggle to deal with the terror they felt that day. Roseanne Martin says she has difficulties even riding a subway train, and the sound of sirens triggers a feeling of "panic." She was riding in the second passenger car of the train on Feb. 26, 2012, and watched the crash unfold outside her window. "I had a bird's-eye view of the car in front of us ... There was kind of a hole torn in it. You could see people kind of hanging in their seats, and there was blood and a lot of of screaming, so that part was very hard." Martin said she suffered some injuries, including sprains to both of her knees and a ankle, and torn ligaments in her left hand. She said she's marking the anniversary of the crash with her therapist. "My challenge is I'm having issues with post-traumatic stress," Martin said. "And there's triggers, especially with sirens … I go back into the moment, to the terror, the terror of what was happening." Martin is one of 55 people who have joined a class-action lawsuit seeking damages in the derailment, which. involved five cars as well as the locomotive, and left three Via Rail employees dead. The Transportation Safety Board said on Monday afternoon it is in the final stage of its investigation into the derailment. 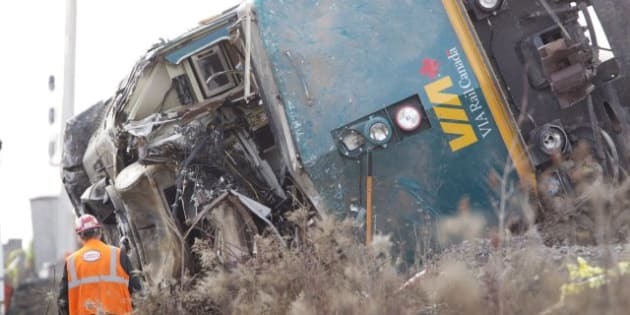 The train was travelling at almost 108 km/h when it derailed, killing three engineers and injuring 45 people — 44 passengers and a Via employee, the TSB said. The locomotive rolled on to its side and struck the foundation of a building near the track, it added. The train was carrying more than 70 people at the time, and dozens of injured were sent to local hospitals. The most seriously hurt were those in the first car. The locomotive fuel tank was punctured and about 4,300 litres of diesel fuel was released. TSB Investigators found the train was going four times faster than it should have been during a track switch. The locomotive and passenger cars "were well maintained and their mechanical condition did not play a role in this accident," the TSB said in a statement released Monday. Ontario's Superior Court ruled in November that a lawsuit in a fatal passenger train derailment could go ahead as a class action. The lawsuit, against Via Rail and CN Rail, seeks compensation for physical and emotional injury, property damage and loss of income for passengers. Passenger Faisal Abid, who is also part of the class-action lawsuit, said he is still shaken by what he experienced on that train ride. He has since moved to downtown Toronto from suburban Scarborough to avoid commuting by train. "It does cause me some distress," he told CBC News. "I can't take the GO train every day now. Thinking about the GO train makes me nervous, and it's gonna probably stay with me the rest of my life."